The gentleman who originally wrote this was Michael Nyland. I have slightly modified it, but all credit goes to him. Many WhatsUp Gold users find this very useful. 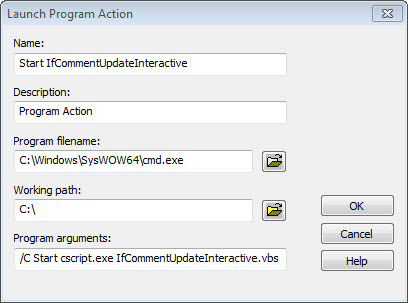 This script allows you to update the comment on interface active monitors so the comment is one of [or a combination of] the following: ifName, ifAlias, ifDescr. If you want to run this against your entire environment, you may need to run this “external” to WhatsUp Gold, so to speak. There is an internal timeout maximum of 60 seconds for scripts run within WhatsUp Gold. If you do need to run this “external” to WhatsUp Gold, you must fill in the database username/password section near the very bottom. If you plan to run directly in WUG [smaller environments], remove the line near the top starting Dim Context. I will also provide a screenshot that shows how to run this “external” to WhatsUp Gold but having it be scheduled as a recurring action.
' as a global reccuring Action that could be scheduled or run manually as needed. 'Choose which values to use, and you can enable more than one. '**Note: The sComment column in the database is limited to 150 characters, anything over that will be trimmed! 'Do a single IP or all devices in the environment? "AND ActiveMonitorType.sMonitorTypeName = 'Interface' "
sqlQry1 = sqlQry1 &amp; "AND sNetworkAddress = '" &amp; sSingleIP &amp; "' "
sqlQry1 = sqlQry1 &amp; "ORDER BY 5,3"
Context.NotifyProgress "No interface monitors meet criteria"
sNewVal = sNewVal + sValArray(x) &amp; " "
sDevChange = sDevChange &amp; nDevID &amp; ","
sTmp = sTmp &amp; DevID &amp; ","
StringIfy = "'" &amp; QuoteChars(str) &amp; "'"
Context.NotifyProgress DevID &amp; " was sent a change event." Create a new program action in WhatsUp Gold with the following settings, pointing at your script you’d like to launch ‘external’. This will use WhatsUp Gold to launch the action, but it will launch as a separate process.